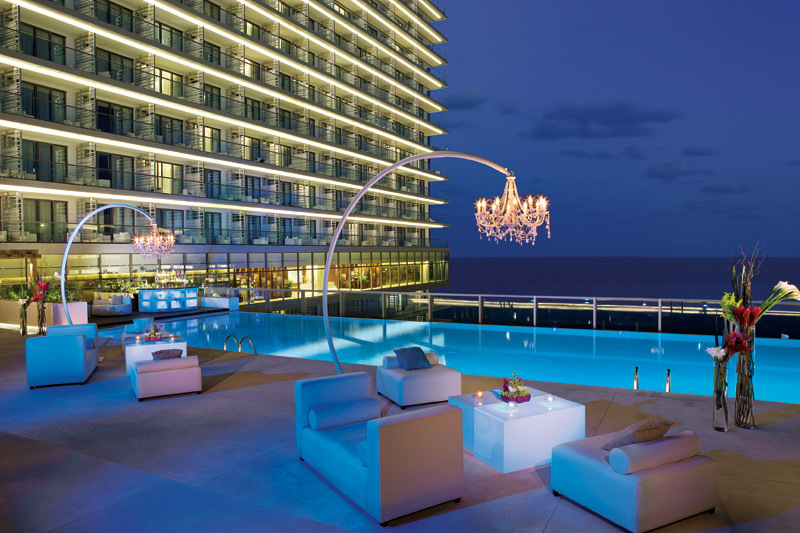 Secrets The Vine, located on a picturesque beach in Cancun, is Unlimited-Luxury® at its most impressive. The signature element of Secrets The Vine Cancun is the extensive selection of fine wines stored in an onsite wine cellar (or “Enoteca”) which provides wine tasting and pairings throughout the week. Guest rooms offer a chic refuge with round-the-clock concierge service, private balconies revealing sunrise and sunset over the Caribbean Sea and Nichupte Lagoon, welcoming beds with fine luxury linens and luxurious baths wrapped in white glass. Designed with self-indulgence in mind, the resort is filled with layers of sophisticated luxury for a relaxing vacation experience. A stunning onsite spa is designed for sheer relaxation and rejuvenation evoking the magical atmosphere of the many real caves and swimming holes local to the area. Designed by the acclaimed Rockwell Group, the resort is Secrets’ first Cancun-proper resort and is filled with layers of sophisticated luxury for adults only (18+). The location is just 9 miles southwest of Cancun’s International Airport and convenient to a vast network of underground rivers and eco-adventure sports including mountain biking, scuba diving, trekking, bird watching, deep sea fishing, archaeological sites, world renowned golfing as well as some of the best shopping, nightlife and gourmet dining the area has to offer. Fine wine is the signature element of the resort. The lobby celebrates wines in both its design and menu offerings with a designated wine tasting area for guests, the Winery (wine cellar). The on-site winery promises guests a rich and relaxing wine-tasting experience. It features a Mexican handcrafted wood table and seating for up to 30 guests, a unique wine wall housing as many as 3000 varieties of wine, and sommelier-lead tastings of some of the world’s finest wine collections. Experience Unlimited Connectivity allows you to stay connected with friends and family, if you choose, while on vacation with the Secrets Resorts and Spas App.